This Heated Micro Plush Throw is 100% Polyester and comes in the decorative colors and prints. It is Luxuriously cozy and provides therapeutic warmth, with an ultra thin wire for added comfort. Also a digital control that has 6 heat settings and a 10 hour auto shut-off for added safety. 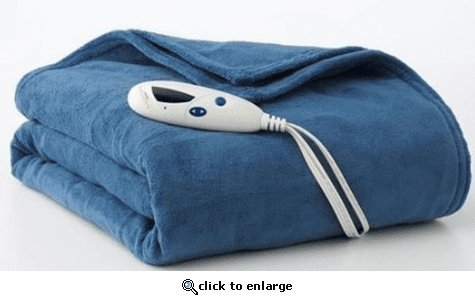 For ease, this heated throw is machine washable, with an extra long 13 foot cord. Skip the winter cold, warm up with your heated throw and enjoy the energy savings as well. Handheld Controller, Therapeutic Warmth, 100% Plush Polyester Fleece, Energy Saving, Machine Washable, 5 Year Limited Warranty. Very toasty and warm. Perfect size. Several heat setting. Large enough to cover my whole body. My daughter and her kids love this warming throw. They cuddle together on the couch watching tv with it. This Biddeford fleece blanket is actually cozy and warm enough without the electric heat! But with the electric heat, it is just terrific and promises toasty comfort during our cold Rochester, NY, winter. The blanket is soft, perfectly sewn and constructed, and warms evenly without any cool spots or hot spots. The electric warming coils are unobtrusive, i.e., practically unnoticeable. The digital control is simple and nicely designed, ergonomic, and allows for five levels of warmth. Seriously, my Doxie, Terry, just burrows in next to me and won't come out. In short, the Biddeford is a first-rate product at a very reasonable price. Pros1. Soft, warm, pleasing color, ample size, safe, and well-constructed. Comfortable fleece! 2. Heating is even and can be increased or decreased using five-level digital control. 3. Price is right---a good value considering the high quality of the product. 4. My dog is pleased, too. ConsNone to speak of, the blanket performs exactly as advertised.